Amaryllis (Hippeastrum) plants are typically purchased around the Christmas holiday and discarded after the blooms have withered, but if the proper steps are taken they can continue to bloom for many years. These tropical plants will do well when placed outdoors during warm weather, and the bulbs can be forced to bloom again during the holidays by providing the right conditions and a sufficient period of rest in fall. Cut off the flower stalks with a sharp knife after they have turned yellow. 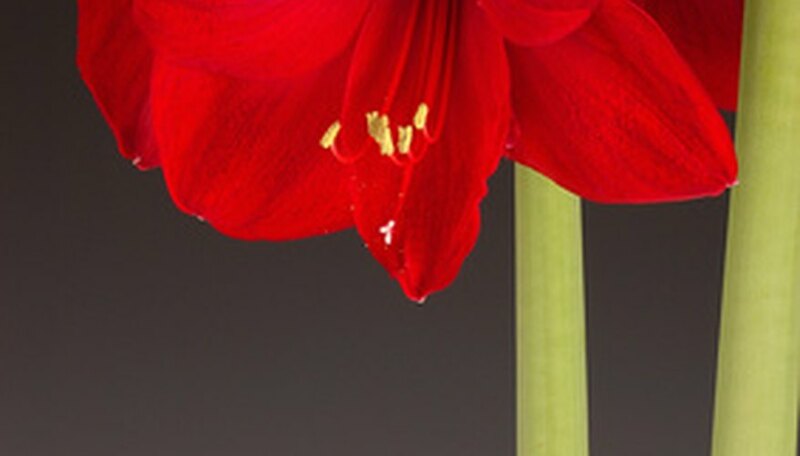 Do not remove the leaves; the amaryllis will use them to produce food that is stored inside the bulb. Place the pot in a sunny location. Add water whenever the top 2 inches of soil stop sticking to your finger. Pour off any water that drips through to the tray beneath the pot. Feed every other week with a 5-10-5 fertilizer mixed according to package instructions. Move the pot outdoors after all danger of frost has passed. Place the amaryllis in a shaded area. After a few days, move the pot into a brighter location. Continue this process until eventually it is in full sun. Dig a hole that is the same width and depth as the plant's growing container. Place the container into the hole and replace the loosened soil. Check the soil in the container often and add water whenever the top 2 inches no longer stick to your finger. Fertilize the plants once each month until late August when you should stop feeding it. Reduce the amount of water added in the late summer. After three weeks of minimal watering, stop watering. When the foliage has shriveled and turned completely yellow, clip the leaves back to a height of 2 inches. Remove the amaryllis container from the garden and place the amaryllis in a dry and dark location that maintains 50 to 60 degrees Fahrenheit temperatures for eight to 10 weeks. This should be done during late September or October. Move the pot back to a sunny windowsill in November and begin to water regularly again. The blooms should reappear during the holiday season. Re-pot amaryllis every three or four years. Do not over-water amaryllis; they are susceptible to root rot if the soil remains too moist.